There are scanty data on the long-term outcome of endoscopic variceal band ligation (EVL) for esophageal varices. 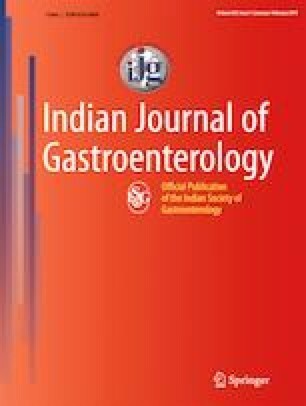 Adult patients suffering from a chronic liver disease (CLD) undergoing EVL of esophageal varices of grade 2 and above between January 2006 and December 2015 were followed up for the recurrence of varices, worsening of portal hypertensive gastropathy (PHG), rebleeding, and mortality. EVL was done as primary prophylaxis of bleeding in 72 and as secondary prophylaxis in 175 patients. All received propranolol after EVL if there was no contraindication. Two hundred and forty-seven CLD patients (mean age 51.83 ± 11.28 years, 179 males) underwent 306 EVL sessions. The most common etiology was alcohol (53%). Sixty-eight percent of patients had grade 3 esophageal varices 76.5% had PHG. There was no immediate post-EVL bleeding or 30-day mortality. Variceal obliteration was achieved in 100% with 19% recurrence within a mean period of 53.74 ± 27.2 months. PHG worsened in 49.7%. Overall, rebleeding occurred in 13.8%, 4.3% from recurrent varices. There was no difference in variceal recurrence (16.7% vs. 20%) and incidence of rebleeding (9.7% vs. 13.7%) between patients undergoing EVL for primary and secondary prophylaxis. Cumulative rebleeding rates after 1, 5, and 9 years were 1.6%, 9.2%, and 11.4%, respectively. The overall mortality was 85%, mostly from progressive CLD, and only 8.6% was due to rebleeding. On subgroup analysis, the factors significantly associated with rebleeding was Child-Pugh class C and worsened PHG those with mortality were alcohol and Child-Pugh class C.
EVL is effective in the long-term for both primary and secondary prophylaxis of esophageal variceal bleeding. GR declares that there are no conflicts of interest. The authors declare that the study was performed in a manner conforming to the Helsinki declaration of 1975, as revised in 2000 and 2008 concerning human and animal rights, and the authors followed the policy concerning informed consent as shown on Springer.com. The authors are solely responsible for the data and the content of the paper. In no way are the Honorary Editor-in-Chief, Editorial Board Members, or the printer/publishers responsible for the results/findings and content of this article.